I’ve enjoyed Steven Herrick’s poetry for kids and young adults, so I looked forward to reading some of his fiction. 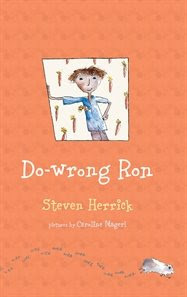 Do-wrong Ron was illustrated by Caroline Magerl, and published by Allen and Unwin in 2003. I would classify it as a junior novel. It’s not written in chapters so much as short segments, almost like free-form verse to look at. It has wide margins, with sentences split to give phrases, or sometimes single words, their own line space and emphasis. This has the effect of making the text look less dense than a conventional format, making it seem an easier read. In other respects, it may not appeal to reluctant readers. It isn’t fast-paced and action-filled. Rather, it’s a gentle story of a boy who wants to do the right thing, but somehow gets himself into scrapes. The sentence structure is not complicated and vocabulary seems to be targeted at kids around eight to ten years old. Herrick has the voices of Ron, Isabelle, Charlie the guinea pig, and other characters exactly right. There are many funny and heart-warming moments in Do-wrong Ron, with a believable, likeable hero who stumbles his way to achievement. Magerl’s line drawings gave me great visuals of the characters, and contributed to an enjoyable read. This book would be a great introduction to writing prose poems with children. Poetry is one of my many reading joys. If you haven't yet explored it with your child, why not check out some of the great children's poetry in your local library.